Bridge the gap between Soft Skills and Hard Skills, to create an optimum balance of Art, Grace and Power; and make the game more appealing to the masses. - Supporting the core themes of this issue. I acknowledge and understand that, there are more than one way of doing and seeing things. This does not mean that the way other coaches train is wrong. My intention is not to undermine or criticize any coach or player personally, for that matter. I just like to show and share the things, without prejudice, from a different angle and perspective. In order to maintain the possession of the ball in a confined space under pressure in the Right Defensive Quadrant (RDQ), the first thing to do is to create an atmosphere of mutual understanding - with the opposing forwards, which has a tinge of fear, to facilitate the execution of intimidation tactics when needed. Just the way the forwards have done, in a game situation, where they are executing a Tomahawk in the opponent’s circle to take a shot on the goal. Hardly any defender comes near them with the fear of getting hurt. Do the defenders come closer in the range of the swing to stop and discourage them from taking a shot? 9 out of 10 times they don’t. In the same way, defenders with the ball have to make it absolutely clear that they are in charge here? Don’t cross this fine line or bear the consequences. Please see below the various real game situations images elaborating the point. 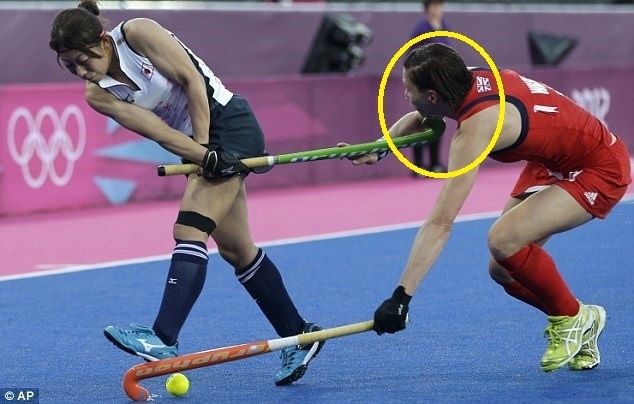 In the above two photos, Kate Richardson-Walsh, one of the most decorated hockey players in the world gets hit by the Japanese player, while defending in her LDQ during the 2012 London Olympic Games Pool match. Kate did get her jaw fractured. So sad. Did the Japanese player spare her? Nobody does, this is a tough world. One can also argue that the Japanese player did not hit Kate deliberately, it was just by chance. The above photo is from the game situation of the 2012 London Olympic Games gold medal match between Germany and Holland. 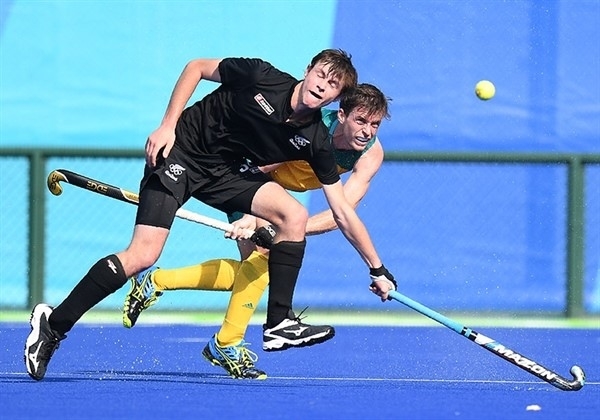 We are seeing Dutch deep defender Sander de Wijn not hesitating to hit the ball hard through Christopher Zeller, German forward, who was putting pressure on him. A good example of the Intimidation tactics. Draw an imaginary line, which the opponent forwards should be aware of not to cross, as there will be severe consequences. This is even done in soccer and is an unspoken law. When their deep defenders have the ball and are in the process of kicking it, forwards usually step back to give space and time out of fear of getting hurt or respect. I may be a bit wrong and controversial here. Keep moving slowly and swiftly with the ball. Changing pace and direction with stop and go plays. Implementing body feints and stick feints. Be on the balls of your feet doing side shuffles, back pedals and pivoting. Please view this video for more details. I am also posting the video link of stick feints from the CNL issue # 3, for your revision, as it correlates. No harm seeing it the second time. Repetition is the mother of learning. Avoid – Unnecessary- running with the ball towards the opponent forward with speed, who is puttingpressure. Why jump in to the hungry roaring lions open mouth. Why go with the ball to the person who has come to steal it from you, in your own defensive quadrant. The strategy and mind set has to be different. Saying to yourself, I have the ball and I am in no rush to just throw it away, resulting in a turnover. Or dribbling directly to the opponent. Let them come and make the first move. It is my ball and nobody can steal it from me. Please refer to the two attached power point presentations below. First one is a Shining example of how the mighty Germans perform effectively in the RDQ. How to synchronize stick work, stick feints and footwork, specifically in the RDQ in order to maintain ball possession under pressure in a confined space. How to keep the ball on one’s strong side (Right) in the RDQ, in order to have more passing options and a better view of the field. How to use the side lines as your alleys. Avoid teaching the young players to spin in a circle as soon as one is put under pressure by an opponent forward. Trying to over protect the ball in fear of losing it, as this also minimizes their quality in positive passing and offensive options. Encourage the players to learn the footwork steps used in the video. First develop these skills in isolation, training in specific game situation, so the players know when and where to apply them. E.G. Right Full back or Right Half caught with the ball on the corner of the RDQ. How to hold the ball for few seconds so your teammates may come to support you or lead away to create space, time, quality passing and receiving options. How will these 3 steps help? Improve players ball control, especially possession skills under pressure. Develop awareness of how to use their personal space, invested space. The importance of elegant footwork. Learn how to take calculated risks to burn the opponents. Coach Shiv and his coaching staff are based in San Jose, CA, USA, and Vancouver, BC, Canada. SCA conducts Coach Education and Elite Youth Player Development programs, worldwide. These programs can be delivered by visiting the respective training centers or on line, using long distance learning. The world is so small and still so big. Thanks to modern technology. SCA has conducted these coaching courses and Seminars for the coaches / players in various countries namely, Australia, USA, Canada, India, and Malaysia, to name a few. “How we see and read the play is a result of our game understanding; “Thought Process”, which creates “Mental Pictures”. These painted mental pictures in our mind, are the driving force to make wise decisions, under pressure during the run of play. The quality of decisions will entirely depend upon, how crystal clear or blurred the quality of these mental pictures are. It’s that simple. Period. Please educate the future champs to develop clear mental pictures, in order to perform in the peak performance zone, under tremendous pressure”. Coach Shiv being an accredited FIH Coach and a FIH Coaching Academy Coach Educator, has been conducting FIH Coaching courses, since 1988. Please contact if you are interested - Email: coachshiv@aol.com. Your feedback and any questions will be most welcome. Thank You! Please join us and be an Active Partner to bring this positive change.